I’ve always had a fascination for the stories of World War Two. The war is full of amazing tales of bravery and daring, of sadness and pain, and of love found and lost. I like to combine all of these elements in my stories. When writing about any era of history, it’s important to get the details right. World War Two history is massive; it’s almost impossible to know everything. But it is possible to focus on one piece of that history and become something of an expert on it. So far, I’ve written two novellas and one short story set in the 1940s, each concentrating on different elements of the war. 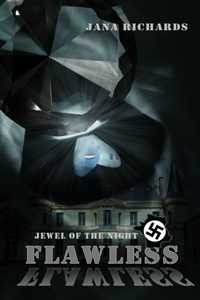 Flawless is set in occupied France in 1942. Le Coeur Bleu, a famous and valuable blue diamond, has been stolen by the Nazis. They plan to trade the diamond for weapons that could crush the Allies. Jewel thief Hunter Smith is recruited to steal back the diamond with the help of Madeleine, a beautiful French Resistance fighter. Home Fires is set in Saskatchewan, Canada just after the end of the war. English nurse Anne Wakefield travels to Canada to marry her fiancé, a former pilot in the Canadian Air Force she met during the war. But when she arrives she discovers her fiancé has married someone else. Devastated, she prepares to return to England. But her ex-fiance’s mother has a suggestion; marriage to her other son. Badly scarred and wounded during the war, Eric Gustafson can’t believe that a beautiful woman like Anne would want him. But Anne sees past his scars to the beauty of his heart. Eric can’t forget that she was once engaged to his handsome, unscarred brother. Her biggest task is to convince Eric her love for him is real. 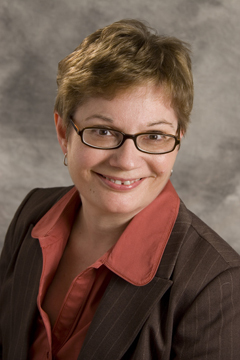 http://www.canadianwarbrides.com/intro.asp . This site has passenger lists from the special war bride ships as well as stories from the war brides themselves. http://www.veterans.gc.ca/eng/history/secondwar/warbrides . This site, from Veterans Affairs Canada, has a lot of great statistics about the war brides. http://canadashistory.ca/Magazine/Online-Extension/Articles/War-Brides.aspx . This site has a lot of good pictures of war brides. 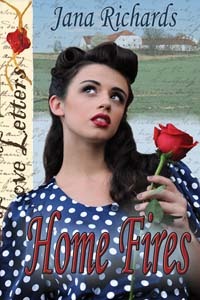 My short story “Wings of Fire” appears in the Saskatchewan Romance Writers anthology, “Love, Loss and Other Oddities”. William Crane is a British airman training in Canada to be a pilot so he can do his part in the war. When he crashes his training plane into a farmer’s field and meets the farmer’s daughter, Will finds a reason to believe that love will find him when the war is over. 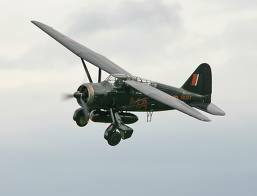 For this story, I researched the British Commonwealth Air Training Program. To start, I visited the BCATP Museum in Brandon, Manitoba, Canada, which contains archives of the program, including many of the training planes used by the airmen. The BCATP trained some 200,000 pilots and other aircrew from all over the British Commonwealth on 231 bases across Canada. The airmen, far from home and lonely, were often befriended by Canadian families who took them into their homes. 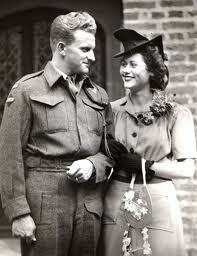 Many romances took place between Commonwealth airman and Canadian women. Though there are no statistics on how many Commonwealth men returned to live in Canada after the war with their Canadian wives, there is anecdotal evidence to suggest a sizable number. “Canada’s War Grooms and the Girls Who loved them” by Judy Kozak tells the love stories of these men and women. I’m hoping to someday expand my short story into a full length novel. The French Resistance, the war brides, and the BCATP are only three of the many stories of World War Two. I can hardly wait to discover more! Jana Richards has tried her hand at many writing projects over the years, from magazine articles and short stories to full-length paranormal suspense and romantic comedy. She loves to create characters with a sense of humor, but also a serious side. She believes there’s nothing more interesting then peeling back the layers of a character to see what makes them tick. There are two important book sales in my city every year. One is held as a fundraiser by the Symphony Society in April, and one is held by the University Women's Federation to raise money for scholarships, in the autumn. Both go on my new calendar in January, and I try never to miss either. This week it was time to attend the CFUW book sale. And I found some gems. My prize was published in 1827! That means a Regency person actually wrote this book, and other Regency people handled and read it. That leaves me speechless...well, almost speechless. I haven't been actually speechless (according to my brother) since the first showing of Star Wars in 1977. I obtained another very old book--one hundred years old, in fact. The Annals of the Strand: Topographical and Historical was written by the prolific E. Beresford Chancellor, and published in 1912 by Chapman & Hall Limited. This is a wonderfully informative book with some great period illustrations and two glossy foldouts of very early engravings. My daughter discovered for me a copy of a book I had long heard of but never seen--Memoirs of a Highland Lady 1797-1827 by Elizabeth Grant of Rothiemurchus. I'm looking forward to reading this; it is full of the day to day minutiae of a Regency lady's life. It was first published in 1898; mine is a 1972 John Murray edition. I was glad to find The English Scene, subtitled In the Works of Prose-Writers since 1700. It is a 1941 Batsford book, and seems to contain a fascinating selection of excerpts by writers as diverse as Smollett and D.H. Lawrence under sections titled The Manor, The Village, The Road, etc. The dust jacket on my $1 copy is not as handsome as this one; mine has a large chunk removed of the river! 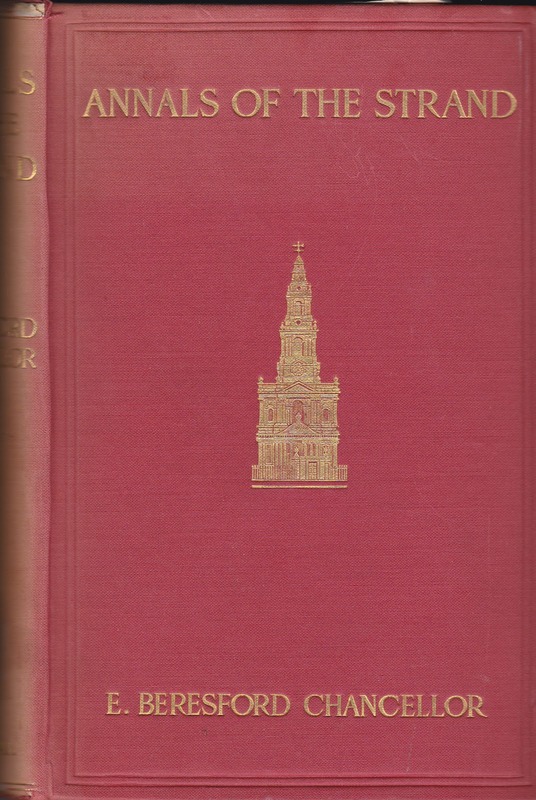 Among my other purchases of fiction and non-fiction was a little book titled The London of George VI. 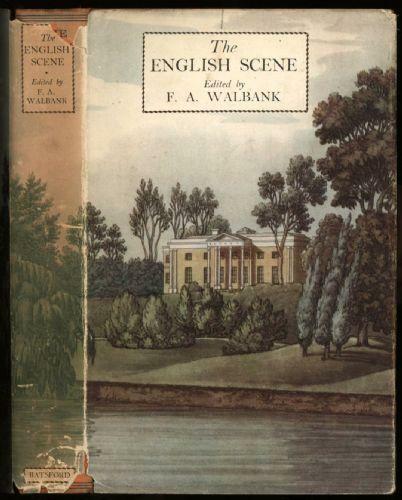 It was published by Dent in 1937 and contains "Sixty-six Photographs and Descriptive Notes of London Scence to-day, with Routes from Piccadilly Circus". It's a wonderful view of London before the Second World War. 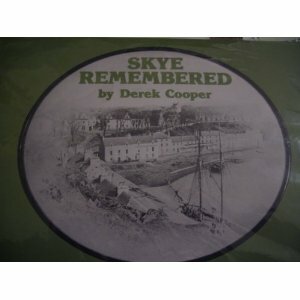 I must mention a purchase of more recent manufacture--1983--a slim book titled "Skye Remembered". With a name like McLeod, how could I turn down this book? It's full of historic photos of the Isle of Skye, in the main from the 19th century. Now I have to look forward to the next sale, in April of 2013. Thank goodness for antiquarian bookstores to fill the time 'til then! Next week, my friend Jana Richards will be visiting and offering us a change of pace and an insight into her World War II research for her romantic fiction. Please join us! When, a year and a half ago, I wrote a post on Charles Molloy Westmacott and his book of 1825 The English Spy, I thought that the illustration The Five Orders of Society was the frontispiece. I have just recently discovered that there was another, official, frontispiece to the book--a glorious, full-colour illustration by Robert Cruikshank. Isaac Robert Cruikshank (1789-1856) was born into an artistic family and became one of the leading satiric artists of the Regency, along with his brother George. This illustration is, to my mind, a perfect microcosm of my favourite historical period, and a triumph of his genius. Westmacott's (aka Bernard Blackmantle) own description of the picture is worth reproducing. Italics are original to the text. is intended to convey a general idea of the nature of the work; combining, in rich classic taste, a variety of subjects illustrative of the polished as well as the more humble scenes of real life. It represents a Gothic Temple, into which the artist, Mr. Robert Cruikshank, has introduced a greater variety of characteristic subject than was every before compressed into one design. In the centre compartment, at the top, we have a view of a Terrestrial Heaven, where Music, Love, and gay Delight are all united to lend additional grace to Fashion, and increase the splendour of the revels of Terpsichore. In the niches, on each side, are the twin genii, Poetry and Painting; while the pedestals, right and left, present the protector of their country, the old Soldier and Sailor, retired upon pensions, enjoying and regaling themselves on the bounty of their King. In the centre of the Plate are three divisions representing the King, Lords, and Commons in the full exercise of their prerogatives. The figures on each side are portraits of Bernard Blackmantle (the English Spy), and his friend, Robert Transit (the artists), standing on projecting pedestals, and playing with the world as a ball; not doubting but for this piece of vanity, the world, or the reviewers for them, will knock them about in return. On the front of the pedestals, are the arms of the Universities of Oxford and Cambridge; and in the centre armorial shields of the Cities of London and Westminster. The picture of a modern Hell, in the centre, between the pedestals, has the very appropriate emblems of Misery and Death, in the niches on each side. Crowning the whole, the Genius of Wit is seen astride of an eagle, demonstrative of strength, and wielding in his hand the lash of Satire; an instrument which, in the present work, has been used more as a corrective of vice than personal ill-nature. I disagree with Mr. Westmacott's final statement, for I find the whole book indicative of ill-nature. Westmacott was an unsuccessful social climber, and he used The English Spy to ridicule the society that would not accept him. But I have discussed the book elsewhere and it is this illustration that now fascinates me. The 'twin genii' of Poetry and Painting are absolutely charming little creatures, each in its own detailed setting. The ballroom tableau at the top is wonderful, the dancers and the harpist clearly delineated, and even a waiter with a tray of glasses included in the tiny scene! The bottom-most drama is chilling in its accuracy. Destitute Misery sits in a filthy alley, or perhaps a prison, and on the other side a desperate gentleman blows out his brains, his despair caused by loss at the tables that form the main vignette. The dark tension of the picture displays the reason for the designation of a gaming table and its environs as 'Hell'. 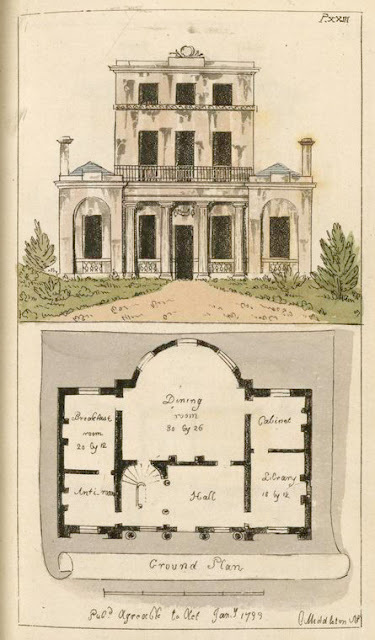 This illustration encapsulates the Regency world to perfection, its heights to its depths. The satiric drawing of Cruikshank surpasses the satiric writing of Westmacott/Blackmantle. The latter is tainted by the ill-nature he denies, the former--the artwork--is undiluted brilliance. At the very top of the picture the Genius of Wit--a fat little cherub who carries the scourge of satire--is crowned by the Prince of Wales' three feathers. Satire, indeed. If you have been a reader of my blog for a while, you will know that I love houses. In fact, I have a life-long fascination with buildings and architecture of all sorts. 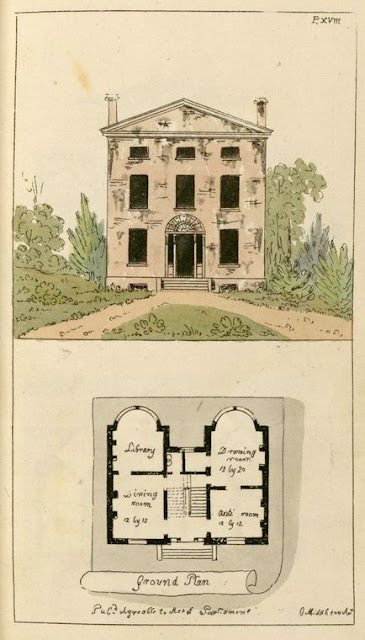 The Architect and Builder's Miscellany, or Pocket Library, Containing Original Picturesque Designs in Architecture, for Cottages, Farm, Country, and Town Houses, Public Building, Temples, Green Houses, Bridges, Lodges, and Gates for Entrances to Parks and Pleasure Grounds, Stables, Monumental Tombs, Garden Seats, etc. I found the drawings in the New York Public Library Digital Gallery, a terrific resource for anyone interested in period pictures of all types. With a little research, I discovered that the author of the book, and its illustrator, was Charles Middleton [1756-c.1818]. He was an architect and a surveyor, and had done work for the Prince of Wales on Carlton House. He presented designs over several years at the Society of Artists and the Royal Academy. 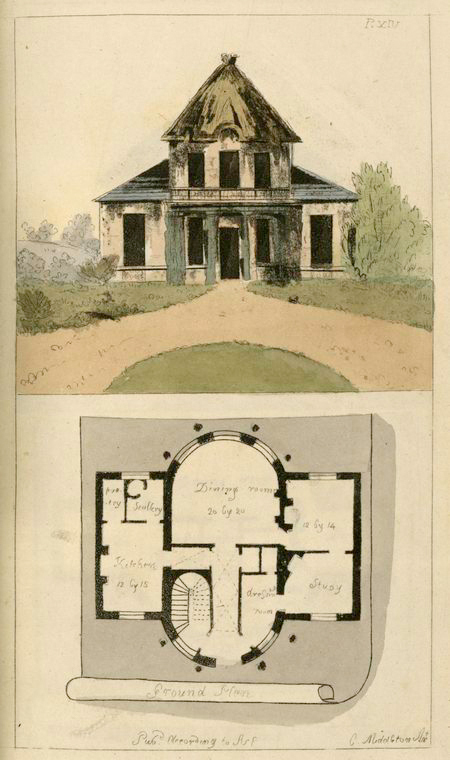 Middleton published at least four books of designs and this was one of his most popular, first published in 1799, and still advertised, in the Edinburgh Review, in 1827. The illustrations at NYPL are all house plans, and they run the gamut from classic architecture to the cottage ornee to the downright eccentric. 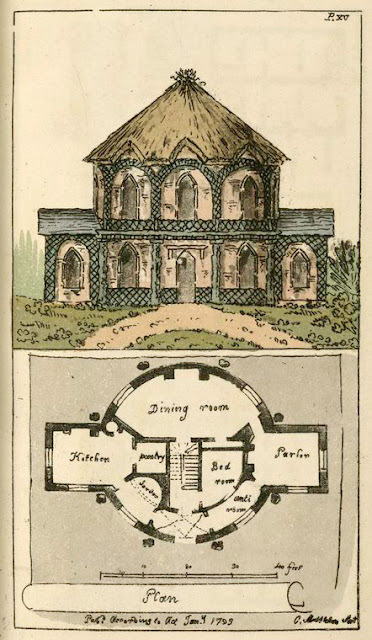 Here is a little folly with five rooms on the main floor, and an unknown number above. I love the conical thatched roof, and just look at the way the rooms are fitted in the circular space! Then there is the classic design of a small home at the top of this post (its most attractive feature, I think, is the lovely fanlight over the door) and a larger classical house below. This rather austere house has a standard floor plan except for the 'Dressing Room' which connects to the Dining Room and the Library. What is that about? The cottage ornee below seems to have a charming ground floor plan that offers all the neccessities of space, and the upper rooms must have been very interesting. 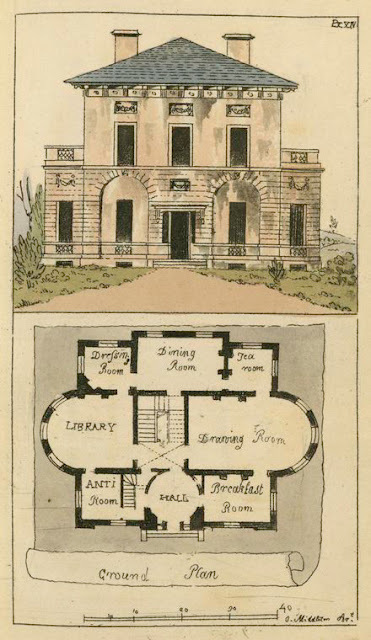 Unfortunately the scan is a little pale, but again there is a 'Dressing Room' to the right of the front entrance just before you enter the Study. Is this the equivalent of our 'powder room'? The elevation of the last house that I will offer is, I think, less than pleasing but the floor plan has its merits. The small room labelled "Cabinet" has distinct possibilities for reading, writing and retreat. I notice that each floor plan offers an "Anti-room" on the Ground Floor. I am wondering if this was an innovation that only Charles Middleton included in his houses, or if it was a well-known addition to the Georgian house. My copy of "Georgian and Regency Houses Explained" does not mention such a thing. I wish that there were plans of the upper floors in this book, but there were only 60 aquatint plates, and I expect space was at a premium given the quantity of structures listed in the extended title of the book. I would love to see the other types of illustrations--Monumental Tombs? Gates for Entrances to Parks and Pleasure Grounds? Nothing fires my imagination like a building which my characters can inhabit. Am I alone in this? Do you love houses?